These films for high-school learners include stories from directors Christine Welsh, Alanis Obomsawin, Dennis Allen, Tasha Hubbard, Sara Roque, and Bobby Kenuajuak, as well as the series Second Stories from Manitoba, Saskatchewan and Alberta, and others from across Canada. Indigenous Cinema in the Classroom is an extension of our Wide Awake Tour for the public. It offers teachers, students and parents the opportunity to watch films selected from our collection of more than 250 Indigenous-made works. We’ve created playlists for these titles, grouping them by student age recommendation and professional development themes for teachers. These are stories about Missing and Murdered Indigenous Women, the Highway of Tears, Indigenous rights activism, violence against Indigenous Women, Indigenous stereotypes, racism, marginalized communities, community healing, the Oka Crisis, the Kahnawake tribe, Cree burial traditions, Indigenous pride, reconciliation, healing and recovery, residential schools, Two-Spirited people, salmon fishing rights, the Mi’kmaq people, historical perspective on contemporary Indigenous issues, village life in Puvirnituq, preserving cultures and traditions, suicide, addiction, substance abuse, co-existence of traditions and modernity, police violence, Saskatoon’s infamous “freezing deaths,” Indigenous women leadership, the Six Nations of the Grand River Reserve blockade, legal, land and human-rights issues, historical and contemporary understanding of relationships between Indigenous people and the Canadian government, the role of radio in a small community of Teetl’it Gwich’in, the Oka crisis and the now-infamous stand-off between the Mohawks, the Quebec police and the Canadian Army. Lorne Olson's short documentary presents a vision he had of two-spirited people dancing, laughing, and smiling. His vision spurs him to rediscover the strength of the past to better face the challenges of today. This funny and buoyant film documents his touching journey. This short documentary explores the legacy of residential schools through the eyes of two extraordinary women who not only lived it, but who, as adults, made the surprising decision to return to the school that had affected their lives so profoundly. This intimate and moving film affirms their strength and dignity in standing up and making a difference on their own terms. In this feature-length documentary, 8 Inuit teens with cameras offer a vibrant and contemporary view of life in Canada’s North. They also use their newly acquired film skills to confront a broad range of issues, from the widening communication gap between youth and their elders to the loss of their peers to suicide. This documentary chronicles the story of Darrell Night, an Indigenous man who was dumped by two police officers in a barren field on the outskirts of Saskatoon in January 2000, during -20° C temperatures. He survived, but he was stunned to hear that the frozen body of another Indigenous man was discovered in the same area. This film is an inquiry into what came to be known as Saskatoon's infamous "freezing deaths" and the schism between a fearful, mistrustful Indigenous community and a police force harbouring a shocking secret. This short documentary offers a portrait of a group of women who led their community, the largest reserve in Canada, Six Nations of the Grand River Reserve, in an historic blockade to protect their land. 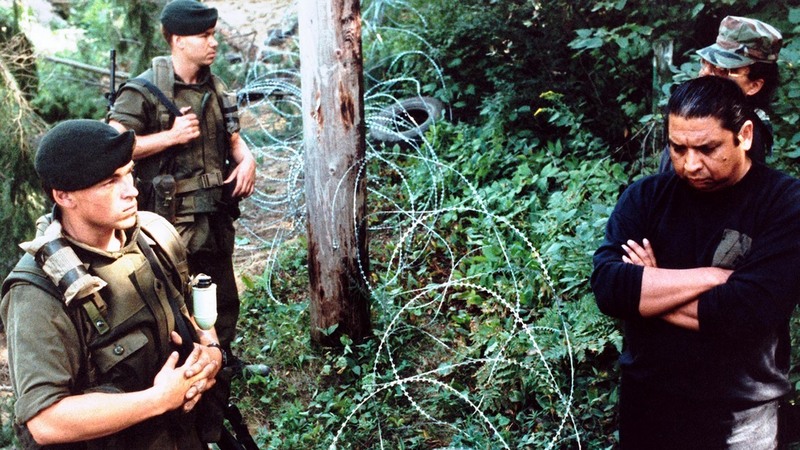 On February 28, 2006, members of the Iroquois Confederacy blockaded a highway near Caledonia, Ontario to prevent a housing development on land that falls within their traditional territories. The ensuing confrontation made national headlines for months. Less well-known is the crucial role of the clan mothers of the community who set the rules for conduct. When the community's chiefs ask people to abandon the barricades, it is the clan mothers who overrule them, leading a cultural reawakening in their traditionally matriarchal community. After years of struggle and shame, 5 Indigenous Canadians bravely come forward with their stories of substance abuse, presenting the sensitive topic of alcoholism in an honest and forthright manner. Alex, Paula, Desirae, Stephen, and Dennis himself maintain a deep and devoted commitment to their traditional culture to achieve long-term sobriety. Through their voices, this insightful doc offers an inspirational beacon of hope for others. This feature-length documentary pays tribute to CBQM, the radio station that operates out of Fort McPherson, a small town about 150 km north of the Arctic Circle in the Canadian Northwest Territories. Through storytelling and old-time country music, filmmaker and long-time listener Dennis Allen crafts a nuanced portrait of the "Moccasin Telegraph," the radio station that is a pillar of local identity and pride in this lively northern Teetl'it Gwich'in community of 800 souls.